Before I went vegan, one of my favorite Indian dishes was palak paneer. I loved this richly spiced and smooth-textured dish, and always ordered it with a heavy dose of hot pepper, garlic naan and a Kingfisher. I had a random and intense craving for it the other day, so I used this recipe which I had bookmarked months ago but had forgotten about. I made minimal tweaks here and there to veganize it, and it produced a palak paneer that reminded me of the authentic version I used to enjoy many years ago. This dish was easy to make, smelled amazing and has just the right amount of richness and spice. Adapted from Indian Simmer. Combine the coconut milk, salt and coconut vinegar into a small and deep glass pyrex dish. Throw in the tofu cubes and stir gently to ensure they are all coated. Cover with saran wrap and place into the refrigerator for a few hours to marinade. Line a baking sheet with a silpat or parchment paper and remove the tofu cubes very gently from the thick marinade, being careful not to squash them. Reserve the leftover marinade. Place the tofu cubes out into nice even rows onto the silpat or parchment. It’s fine to have the marinade kind of pooling around the tofu cubes, Bake for 45 minutes to an hour until to slightly browned, rotating them every 15 minutes to prevent scorching. Place the onion, garlic and ginger into a food processor and grind into a paste. Transfer to a medium-sized pot with the vegetable oil. Allow to slightly caramelize over medium-low heat for about 10 minutes, stirring a few times to prevent overbrowning. Decrease the heat to low, then add a few dashes of salt and the next four spices and chilis (if using), then allow to simmer for a minute or two. Throw in the tomatoes and stir to combine. In another pot, throw in the frozen spinach with about a cup of water. Simmer over medium-high heat until the spinach is completely heated through. Transfer the spinach to a food processor and puree until smooth, then transfer it to the pot with the onion and spices and stir well. 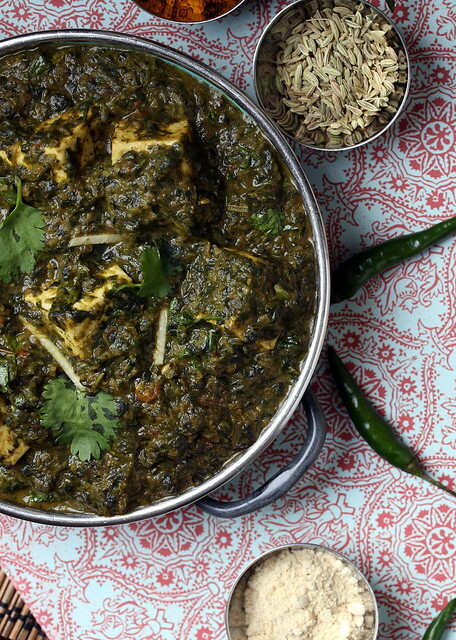 Allow your saag to simmer in the pot over low heat while you wait for your tofu to finish baking. Once it’s ready, pick the silpat up like a taco, and dump the contents into the pot, being sure to scrape in the the little bits of caramelized marinade and oil and stir well to combine. Add in the rest of the reserved coconut marinade (about 1/3 cup). Garnish with the fresh cilantro. Serve with basmati rice and vegan naan. These curried chickpea and onion fritters would be a perfect appetizer to go along with this dish. yes! i love palek paneer!! this looks phenomenal!! wow, this looks amazing, lady! i really must try this out! Coconut vinegar isn't critical to the marinade here, so if you can't find it, I'd just leave it out. Enjoy! Beautiful dish! This is the most creative way I've seen to make non-dairy paneer. 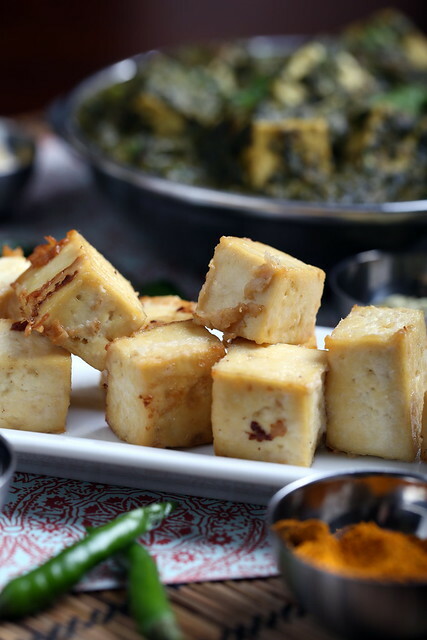 So many people simply substitute tofu cubes for the paneer, which is a sad, tasteless stand-in for homemade paneer. I'm thinking the little bit of vinegar might give the cubes that characteristic underlying subtle sour note. Brilliant. I think I'll steal it and see if it'll work in my all-time favorite, "Mattar Paneer." The only suggestion I have (and it's for your health, not just flavor)is to use extra virgin coconut oil instead of vegetable oil. Thanks very Alan! Yes, I agree with you — the tofu needs fat with a hit of acidity to hit the mark in texture and taste of paneer. My favorite part was the bits of caramelized edges that formed around around the tofu during baking time. I hope it works well in your mattar paneer! It did not occur to me to use coconut oil instead of veg oil but, you're right — that's much better! I trippled your recipe tonight, and it was just delicious. It was a little more saucy than yours, but there was homemade naan and lots of rice to mop it up. Yum! Thanks for sharing. I am so glad that you liked the recipe! Thanks for trying it out and for your feedback. I have never made my own naan, but maybe I should — finding prepared vegan naan is sometimes a bit of a challenge! Looks fabulous, Richa is amazing! You are an absolute saint! 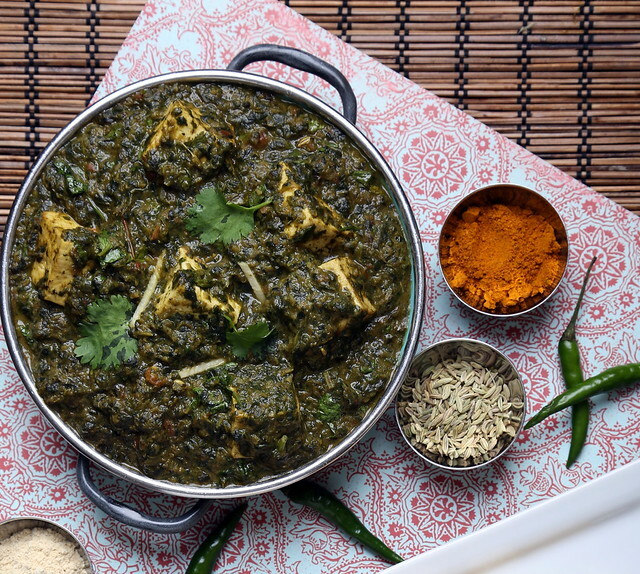 Palak Paneer is my absolute favorite food and I have been dying for it since I went vegan! You saved me from falling from grace! I had never tried palak paneer before going vegan and now I can't when we're out. I was so excited when I saw this post and made this for dinner last night (using almond milk for coconut milk since I was out).. AMAZING! I have leftovers for lunch today. Thank you so much! The recipe sounds great, but I absolutely love the photo. So well composed. Saag Paneer was always my favorite Indian dish as well- so happy to have found a vegan version! I love the idea of marinating the tofu – I can just imagine that the coconut and vinegar would give it a paneer like taste. I have never seen coconut vinegar. Do you think I could replace it with another type of vinegar. Apple vinegar maybe? I've never used apple cider vinegar for this cheese before, and have had mixed reviews on using it instead of coconut vinegar. You should be able to find coconut vinegar in an asian grocer or online — good luck! I just made this today and it's amaaaaaazing! I never thought spinach and tofu could taste so good. I will definitely be making this again. 🙂 Thanks you so much for the recipe! Alicia, thanks for your feedback and I'm so happy you enjoyed it! SO GOOD!! Thanks for sharing! I made this today, and I can testify that it was excellent!!! It only needed one chili pepper in my opinion; it was quite spicy. I also had to add more salt, but that's because I am a newly returned vegan and am accustomed to overly salted food. It was so healthy and delicious and very close to what you'd get at your favorite Indian restaurant. 5 stars, thank you! so happy to hear … thanks for your feedback! I'm the man who never cooks. I'm in my favorite Indian restaurant four to five times a week. They may never see me again after cooking this today, it's amazing, taste great. My only issue is the coconut oil. I burned a few gallons of gas trying to find it, not even the Indian grocer ever heard of it. Where can I find it? I made this – I tried one vegan version with the tofu, and also a vegetarian version with paneer cheese. Both were awesome. A perfect spice blend for a flavourful sauce.